As shown on this deed, the Nettas receive mail at 15 Wetumpka Lane, Watchung, NJ 07069. 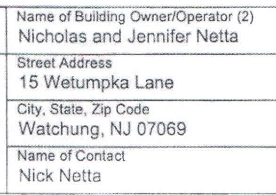 Page 12 of this document provides further proof that the Nettas own 15 Wetumpka Lane. Page 39 of this document shows that 15 Wetumpka Lane is the mailing address for Elm Avenue Properties. Go to the ELEC website with lobbyist reports. Click to download All 2008 Summary Data Download Excel Spreadsheet. In the sheet Receipts Table, note line 464 showing a $10,000 payment from Elm Avenue Properties to Keywood Strategies. Click to download All 2011 Summary Data Download Excel Spreadsheet. In the sheet Receipts Table, note line 547 showing a $5,000 payment from Netta Architects to Keywood Strategies. I am sure with your long knowledge of county dealings you can easily tell where these documents lead. Netta Architects paid Angie Devanney at least $10,000 while George Devanney was in charge of awarding contracts to Netta Architects. I say at least $10,000 because the time frame for the $5,000 payment is unclear. It could have been after George’s resignation and also because there may have been additional contracts outside of the purview of lobbyist disclosures. You may notice many other familiar names pop up – like MAR which built the 921 Elizabeth Avenue Union County One-Stop Career Center, which opened while George was county manager. “With this said, I’m sure you shall agree that we have good reason to offended and concerned by your insinuations or claims that we may have obtained work through unethical, immoral, illegal or elicit methods, behavior, practices or means that include or suggest foul play on our part from cronyism or political contributions that are not within the legal limits to the State of New Jersey’s Pay to Play contribution laws. We respectfully request that your comments posted on your website suggesting or implying such illicit behavior be removed immediately. You have implicated us without any evidence of such findings as shown in the Pay-to-Play report that is uploaded on your page.” – Jennifer Netta, 2011. Well I guess this is the evidence you needed in 2011!